If you’re not familiar with penstemons, I’d like to tell you about these brilliant garden plants that I think are often overlooked and are definitely worthy of a little more attention. 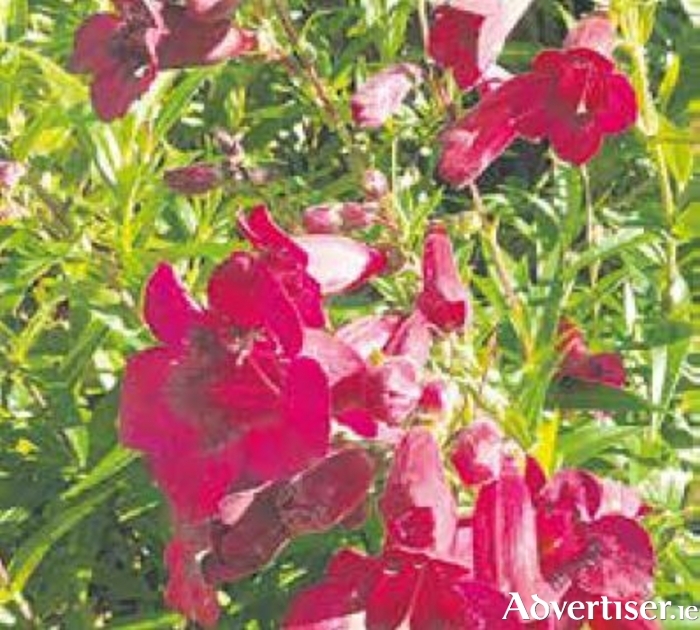 Penstemons are technically a perennial rather than a shrub, although you will probably find that older plants, in particular, can get quite woody at the base which can be confusing. They’re a bushy plant usually reaching a height of about 60 cm by 60cm, (that’s about two feet in old money ), although sizes do vary. Bell shaped flowers slightly similar in shape to those of campanula are clustered at the top of each stem. Flowers are mostly on the red/pink purple and white spectrum, some with white interiors and attractive line markings. They are brilliant in borders with other perennials and ornamental grasses. I wouldn’t be inclined to put them at the very front of a border ideally, as the woody bases can get a bit scraggly looking, so if you have room, some hardy geraniums or something of a similar size would be perfect in front. Another valuable feature is that the plants retain their leaves in winter so although they don’t have the most attractive foliage in the world, they are at least green when not much else is. Penstemons aren’t really hardy, so a hard frost can finish them off and in the really severe winters of 2009 and 2010 I lost all of mine, but those were unusually harsh and in this part of the world they tend to survive winters without any problems. To keep them looking fresh and bushy, the best thing to do is to cut them back in early spring by about a third to a half – getting the timing of this right is important though and I definitely wouldn’t chance it before March at the earliest. A late frost can be fatal if you’ve cut them too early. They do tend to flower better on richer soils with some clay content, so if your soil is very free draining and low in nutrients, provide oodles of organic matter such as farmyard manure or home made compost, and mulch them thickly every spring with lots more of the same. Cuttings are a great way to insure against winter losses and luckily penstemons root quite easily from semi-hardwood cuttings, taken around late September ideally. I would insert three to four prepared cuttings around the edge of a 9cm or 3 inch pot and cover with a clear plastic bag secured with an elastic band. Make sure the compost is gritty and free draining. When rooted, pot them on or wait till early spring before potting on into richer compost and hardening off. One of the most freely available cultivars is Penstemon “Andenken an Friedrich Hahn”, also sold under it’s easier to pronounce name of “Garnet”. It’s what I call a “good doer” and it’s crimson flowers add a lovely splash of colour to any summer border. The Show Ain’t Over – Last Blast of the Perennials! Planting Bulbs for Spring Scent-sation! Page generated in 0.0644 seconds.